2102 West Encanto Boulevard, Phoenix, Arizona 85009, U.S.
Arizona Department of Public Safety (AZDPS) is a state-level law enforcement agency with a primary function of patrolling and enforcing state laws on Arizona highways . The Director is Frank L. Milstead, who began his 4-year term in February 2015. Its headquarters are in Phoenix. 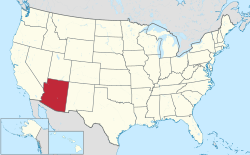 Following legislation in 1968, the Arizona Department of Public Safety was established by the executive order of Arizona Governor Jack Williams on July 1, 1969. This order amalgamated the functions and responsibilities of the Arizona Highway Patrol, the Law Enforcement Division of the state Department of Liquor Licenses and Control, and the Narcotics Division of the state Department of Law. In its 50-plus years of service, the department has become an organization dedicated to protecting and providing state-level law enforcement services to the public and developing partnerships with agencies sharing similar missions. In 2011, the Arizona State Capitol Police department was merged with DPS, alongside the Highway Patrol Division. ASCP was responsible for the State Capitol Mall in Phoenix and the Tucson State Complex. Today the Capitol Police still exist and patrol the Capitol grounds, but they are now full DPS officers and use DPS cars, logos, and uniforms. Capitol police officers wear special Capitol Police patches on their uniforms. The vehicles of choice for the Arizona DPS/HP are the Ford Crown Victoria with the Police Interceptor package, Ford Explorer, Ford Taurus, and the Chevy Tahoe police package SUV. The department issued weapons are, for handguns, FN Herstal FNS Long Slide chambered in .40 S&W or 9MM, SIG Sauer P226 chambered in .40 S&W, or the alternative issue SIG Sauer P229 in 40 S&W. For long guns, DPS uses the Patrol rifle 223 caliber Colt AR15A2 Colt M16A2 or Colt M4 supplied with 2, 30 round magazines. The 12 gauge Remington 870 shotguns are not authorized for carry and have been modified for less lethal munitions. SWAT Troopers are issued fully automatic LWRC short barreled rifles. The ranks of lieutenant and commander were abolished and converted to captain and major respectively in 2010. On July 24, 2015, officers officially became known as State Troopers. Currently, the Arizona Highway Patrol uses Ford Interceptor (SUV and Car), Impala 9C1, Tahoe PPV, Crown Victorias, F-150s, and Expeditions. They do have one marked Dodge Ram Pickup. Unmarked vehicles are commonly Impalas, Crown Victorias, F-150 and 250 pickups. Motorcycle units primarily consist of BMW RT-1200s. In the past, automobile manufactures would donate cars to the department for testing. It would not be unusual to see luxury cars such as Lincoln Town Cars, Ford Thunderbirds, and others. The Special Enforcement Bureau enforces rules and regulations regarding the operation of commercial vehicles on the roads and highways of Arizona. The emphasis is on vehicle safety, driver safety, and proper authority and compliance for vehicles operating in commerce. The Technical Services Division develops and coordinates scientific, technical, regulatory, and support services by providing scientific analysis and criminal justice support to Arizona’s criminal justice agencies. TSD also develops, operates, and maintains the data processing and data/voice communications systems statewide and operates facilities management and logistical support. The Agency Support Division (ASD) exists to support the mission critical units of the Arizona Department of Public Safety. The Agency Support Division provides support and management services that promote government efficiency, contemporary research and planning, legal services, coordination of financial and human resource services, records and public records services, department training, cost effective facilities management, innovative logistical support, and provides statewide aviation support. Since the establishment of the Arizona Department of Public Safety, 30 troopers and 4 K9s have died while on duty. The agency, along with the Arizona Highway Patrol Association, remembers each fallen officer at an annual memorial ceremony on the first Monday of May. ^ "Arizona: Population estimates". U.S. Census Bureau. July 1, 2017. Retrieved May 6, 2017. ^ "CONTACT INFORMATION." Arizona Department of Public Safety. Retrieved on January 9, 2011. "Physical Address 2102 W Encanto Blvd Phoenix, AZ 85009"
This page was last edited on 29 March 2019, at 21:13 (UTC).